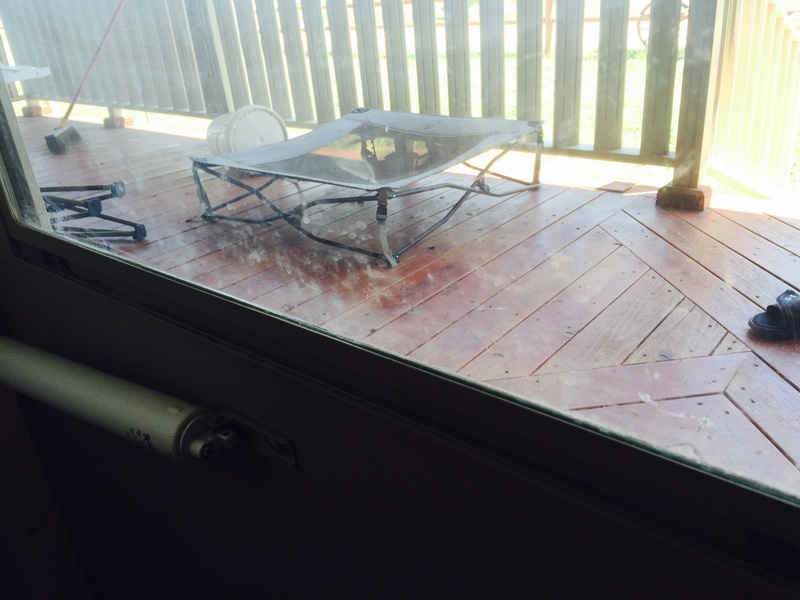 Today, I took a picture of our screen door with our son’s fingerprints all over it. Then, I selected a puppy to hold on my lap while the rest were sleeping. A few things are coming to an end and I’m a bit sad about it. It’s a tough reminder that things will change and soon be different. Our son is growing up and most of the puppies will soon be moving out..
We are down to one nursing session before bedtime. Somehow, over the past two months, we have managed to eliminate all the other sessions and have replaced them with milk in a sippy cup. This is a major accomplishment since we were nursing whenever he wanted to and that tallied up to approximately ten times every day. I don’t want to stop. He doesn’t want to stop-there are still times he asks to nurse during the day and I have to tell him no. It kills me to tell him no. However, we want to try for a sibling and our doctor highly recommends that we stop nursing to help regulate my cycle. Sigh. So, we plan to wean him completely by the end of July. That gives me thirteen more moments of peaceful bliss with our son. The countdown breaks my heart. I have another countdown, the countdown for the puppies to transition to their permanent homes. The puppies bark/whine a lot and are not fully potty trained so I figured this would be a much easier process. That is, until someone recently came to pick out a puppy. As they debated between the black collar vs. no collar, I found myself thinking “no, don’t pick that one!”. We already have our dog picked out-Purple Collar, aka Aria. Still, when it comes down to it, I don’t want them to leave. It’s going to be awfully quiet when they do. SO…my focus for this week and from here on out is to focus on what I should be cherishing instead of what I’m losing. I’m going to try and enjoy the small things and stop worrying about the house being messy, the porch being cluttered, the yard not being mowed, etc. I’m going to be grateful for what I do have. Hang in there! I was a wreck when my 3rd child gave up that last before bed nursing. But she’s a sweet happy 8 year old now and she fills my heart with so much joy in so many other ways!! My children are grown but still living with us and I have to say that every day is a blessing. I thought I would really miss the baby stages and then the toddler stages, child stages, teen stages, etc. but with every stage comes new wonderful experiences to somehow ease the transition. Cry though, it’s all part of the process and it does help. Hold on to what you have as long as you can but be comforted to know there are even better times ahead.